VietNamNet Bridge – The unique way of decorating the dead (putting sea snails into the eye sockets) that were discovered by archaeologists of the Vietnam Institute of Archaeology in Phia Vai cave in Na Hang, Tuyen Quang province, has revealed the burial secrets of primitive people. 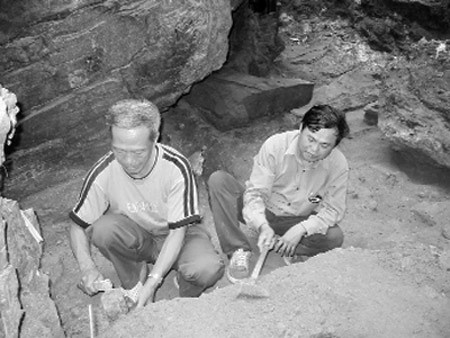 Dr. Trinh Nang Chung (right) has discovered many ancient relics in the Phia Vai cave. Dr. Trinh Nang Chung, from the Vietnam Institute of Archaeology, said Phia Vai cave in Coc Ngan village, Xuan Tan commune, Na Hang district was discovered based on the legend about the Phia Vai "mountain ghosts." Indigenous people said that this sacred cave has ghosts. There have been many local people who got lost in the cave and then became mad. It took a long time to convince the local authorities to help Chung and his colleagues to get into the cave. Archaeologists bought sticky rice, chicken and offerings and invited a shaman to maker rituals before the adventure to assure locals. It was also very hard for them to hire local workers for digging archaeological sites. Digging the cave at the depth of over 50 cm, Chung saw a few pieces of bones, looking similarly to the bones of chickens and pigs. Knowing that remains were going to be revealed as rumors, he covered the bones by canvas and joked that these were just animal bones in the cave, to not make local people scare. According to experts, the door of Phia Vai cave is 35 meter wide, 11 meter deep and 4 m high. Unfortunately, large limestone rocks fell down from the ceiling so archaeologists could not excavate a large area in the cave. In the remaining area, archaeologists dug two large holes, with an area of 40 m2, and found hundreds of artifacts. However, the most valuable artifact is a set of remains of over 10,000 years old. The dead person was placed in a lying position, with the head on a rock and the legs stretched out. Based on the hard limestone sediments and rough tools that were buried with the dead, Chung said that the Phia Vai relic belongs to the Hoa Binh culture dating back to 12,000 years. In particular, around the remains, experts discovered traces of circle fires and huge rocks, which were probably used as chairs by the primitive men in community activities. 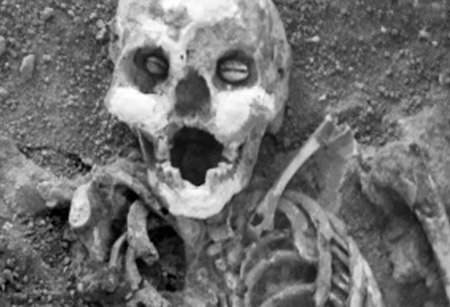 Surveys show that this is the remains of a woman with a high position in the primitive community, at the age of 45-50. She is about 1.56 m tall. Notably, two sea snails are put into the eye sockets of the dead. According to experts, this is the species of sea snail named Cyprea arabica. The snail on the left eye socket is 27.23 mm long, 16 mm wide. The one in the right eye socket is 21.61 mm long, 13.13 mm wide. They said that at that time, people used this type of sea snail to barter like currency. During the burial, they placed a snail on each eye. When flesh decomposed, the snails dropped to the eye sockets. "The primitive remains in Phia Vai cave have a great value for archeology. It is a great discovery, which needs to be thoroughly researched," said Dr. Trinh Nang Chung.